Shipping and Prices: F.O.B. unless otherwise indicated, Shipping Point., title passing at such point. Prices subject to change without notice and apply to orders shipped to any point in the U.S. or it�s possessions. Shipments: Domestic transportation unless otherwise instructed. All charges, (freight, insurance, fees, forwarding costs) collected at destination, or prepaid by us & added to invoice. Packing: Included in the shipping costs for domestic shipments, unless otherwise indicated. Chemicals may require additional package charge to conform with DOT regulations. 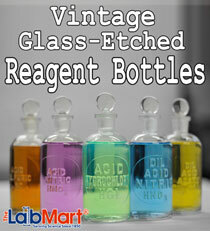 At LabMart.Com we expect you to be completely satisfied with every item you order. If for any reason, you are not, please contact our Customer Service number for a return goods authorization number (RGA#). All returns must be made within 30 days of date of purchase and may be subject to a restocking charge. No returns will be accepted without an RGA number. Damaged Shipment: Sign for material with carrier as damaged, then Notify Us ASAP. Keep original pack material. Obtain carrier inspection report. Note: As a distributor, J&H Berge, Inc. warrants that the representation made for the products in this catalog accurately reflect the manufacturers representation to J&H Berge, Inc. J&H Berge, Inc. expressly disclaims all other warranties, whether expressed, implied or statuary, including the warranty FITNESS FOR USE, and MERCHANTABILITY. In no event will J&H Berge, Inc. be liable for consequential damages arising out of the products described herein.